DC Entertainment's immensely popular DC Super Hero Girls line of comics, toys, books, videos, and games is adding another digital series starring a certain Green Lantern. 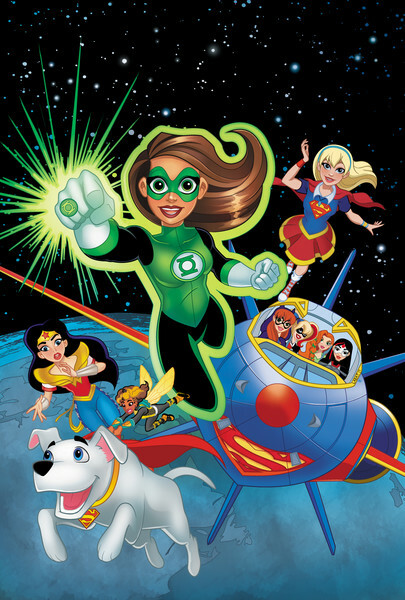 Jessica Cruz will be leading her own series DC Super Hero Girls: Spaced Out written by Shea Fontana with art by Agnes Garbowska. Cruz heads to Oa with some of her best friends to introduce herself to the Green Lantern Corps. The 12-chapter series begins Monday, November 20. She's the newest student at Super Hero High and the newest Green Lantern of the earth with a lot still to learn. She joins teenage versions of Wonder Woman, Supergirl, Batgirl, Bumblebee, Harley Quinn, and others for accessible kid-friendly adventures. More importantly, Cruz adds to the diversity of the line with a Latina superhero. Fans of the DC SUPER HERO GIRLS series can hear all about the new tale by joining a special Facebook Live broadcast on the DC Kids page on Monday, November 13 at 3p.m. PST. Begin submitting questions now about the story and characters, including our favorite pup, Krypto the Super-Dog, by commenting on the DC Kids Facebook post, or by using #AskDCSuperHeroGirls via Twitter. Bi-weekly digital chapters of DC SUPER HERO GIRLS: SPACED OUT can be downloaded via the DC Comics App, readdcentertainment.com, iBooks, comiXology, Google Play, Kindle Store and Nook Store.